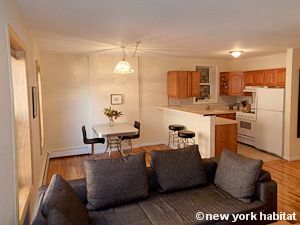 This is our reference NY-15608. 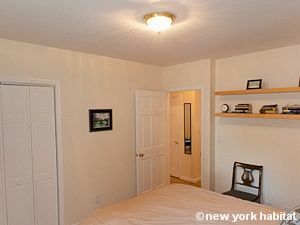 Discover Vinegar Hill in this fully equipped two bedroom furnished apartment situated on Front Street and Bridge Street in Brooklyn, New York. 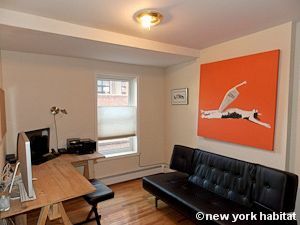 This historic community has maintained its 19th century look despite the modernization coming in from the surrounding Dumbo and Brooklyn Navy Yard areas, and this apartment in a landmark building is no exception! Quite spacious in size (about 900 SQF or approximately 84 SQM), this townhouse apartment is on the third floor (considered the second by Europeans) and has a intercom system for guest entry. 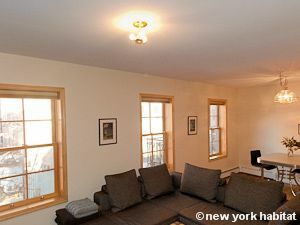 There are windows with double exposure and beautiful hardwood floors throughout the apartment. 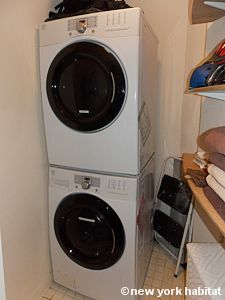 Not to mention, there is a washer and dryer giving you the convenience of not having to travel to the laundromat. Additionally, this building has the benefit of having a common terrace behind the building, equipped with shared BBQ for those summer cookouts. 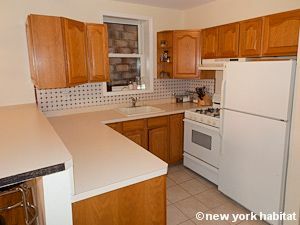 As you walk into this two bedroom apartment, you will be greeted by the open kitchen, and will be sure to notice the cabinet and countertop space. 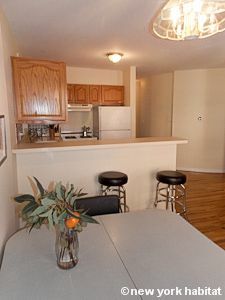 Besides a gas range and fridge, this kitchen has a dishwasher, toaster and coffee maker, making your life hassle free. 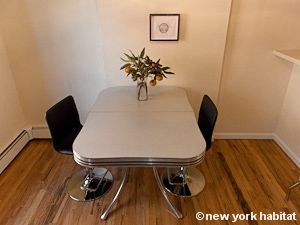 Separating the kitchen from the dining area is a bar-like area with stools for two, but if you prefer a more formal meal, the vintage table is a perfect place to spread out. 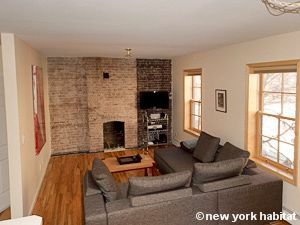 The sunlit living room boasts a large sectional sofa with a center table and a non-working, but unique exposed brick fireplace. 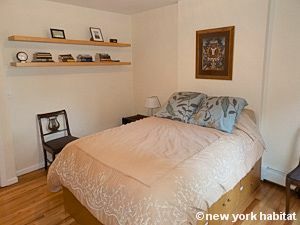 There you can relax while watching cable television or reading. 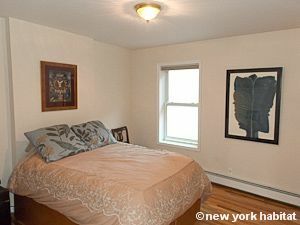 The master bedroom has a full-sized bed along with a closet, nightstand and two chairs. 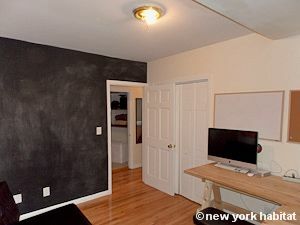 Bedroom # 2 on the other hand is perfect for those who are looking to catch up on some work, as there is a desk and a chalkboard wall for working out your ideas. 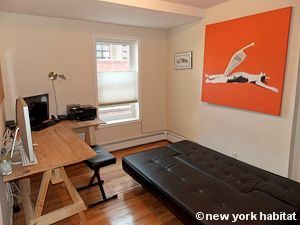 The futon that transforms into a full-sized bed when the room is used as a bedroom. 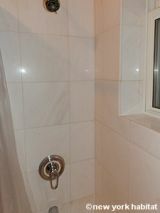 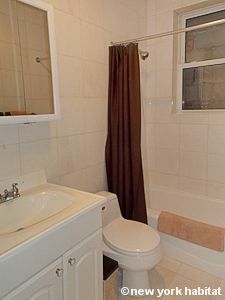 If you feel like really relaxing, then you can take a bubble bath in the white tiled bathroom.